Perfect for morning tea or an afternoon snack, they go down super well with a long black in a team meeting. When you become ‘that person’ who brings in the snacks, you become an indispensable part of your team. 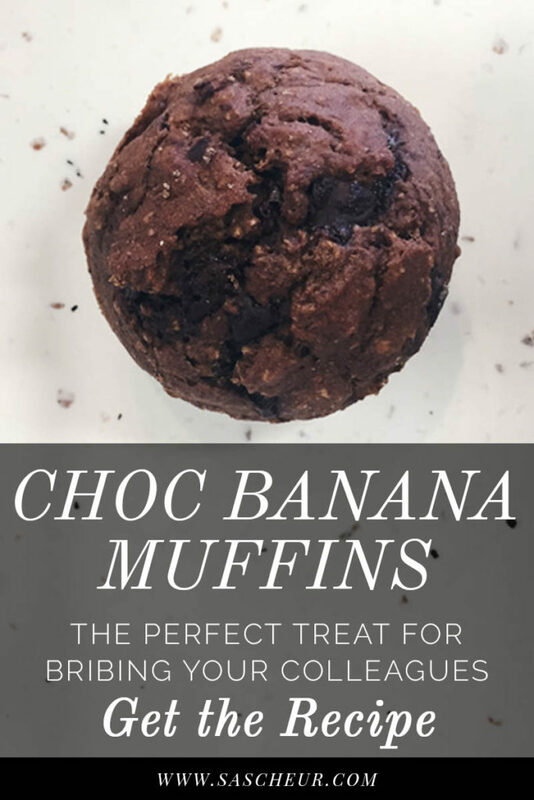 These Banana Chocolate Chip Muffins are an office favourite and pair well with a strong coffee. I have one primary go to recipe: my Ultimate Healthy Banana Bread, which I’ll get around to sharing very soon. 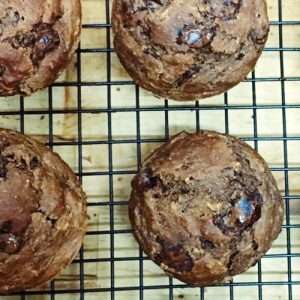 These Banana Chocolate Chip Muffins are a variation on that recipe, and are an intuitive snack baked with a love of chocolate. They’re also super healthy, with zero added sugar, and I’ve recently started using Lupin Flakes from The Lupin Co. to cut down on the carb content. I’m glad you asked! It’s part of the legume family that grow particularly well in Australia and have a surprisingly high protein content (40%! ), which makes you noticeably fuller for longer. They have a slightly nutty flavour, especially when toasted, and this works really well with banana muffins. Keep in mind that they absorb water, so make sure you add extra water or Almond Milk when you’re cooking to ensure the right cake-batter consistency. As I mentioned in my Sugar-Free, Healthy Chai Tea Pumpkin Gingerbread Loaf (a mouthful in more ways than one!) I’m super lazy when it comes to baking and prefer to cook with as few utensils as possible so as to minimise clean up. 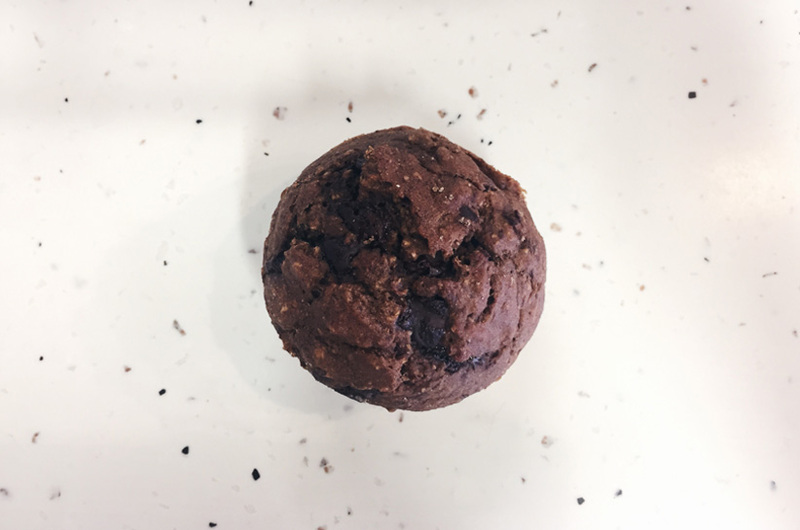 With these delectable morsels, I’ve stuck to my tried and true method of dumping everything willy-nilly into my trusty Ronson Food Processor and hoped for the best. Luckily they were a moist, delicious success and my colleagues loved them. TIP: If your bananas aren’t ripe enough, put them unpeeled in the oven on 150C for 30 minutes. The skins will blacken and the sugars will come out of the fruit, making them sweeter. Be careful – the inside will be crazy hot and partially liquified. 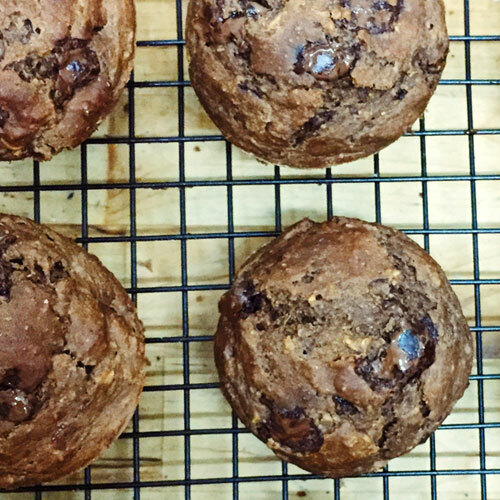 These super healthy muffins don’t need any added sugar or sweetener whatsoever. No honey, no stevia, no applesauce. Choose super ripe bananas and enjoy their natural sweetness – trust me, it’s enough. Personally, I added a whole 200g bag of Cadbury Dark Chocolate Chips, but this was probably delicious chocolatey overkill. Enjoy! 2. Mix Bananas, Eggs, Vanilla Essence, and Coconut Oil until combined. 3. Add Wholemeal Self-Raising Flour, Bicarb Soda, Baking Powder, Cinnamon, Cacao Powder and salt. Mix until it becomes a bit too doughy. 4. Add the Almond Milk and mix for another minute until it looks like a nice cake batter. 5. Add in the Chocolate Chips and mix for about 5-10 seconds just so they are evenly distributed throughout the batter but haven’t been overly shredded and have kept their shape. 6. Pour into a prepared* muffin tray and bake for 25-30 minutes. 7. Let sit in pan for about 5 minutes until the pan is cool enough to touch. Use a butter knife to loosen them from the pan and transfer to a cooling rack. 8. Share with your colleagues for brownie points. *I’ve been using spray coconut oil with a bit of flour sprinkled into the bottom – it makes preparing cake tins a breeze. Add additional Almond Milk as needed to ensure a cake mixture consistency. The Lupin Flakes can absorb moisture, so add as much as you think is necessary by tablespoon (probably about an additional 1/4 Cup in total).